This product was designed with significant input from the client, a very large school district, with the primary end result being a power distribution product for use in a child-centric environment. 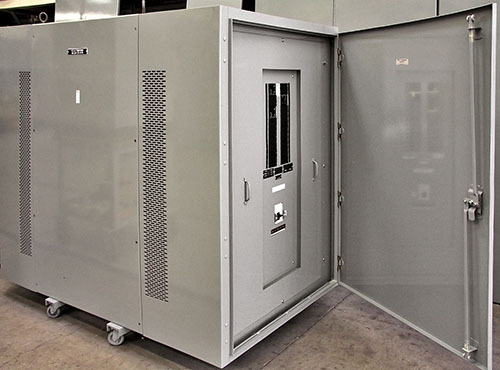 This resulted in a construction method that provided a unitized enclosure for a factory-assembled, ready to install power center. The design allows effective transformer cooling without permitting access to live conductive components. It features fasteners that are not operated using commonly-found tools but certainly found in any electricians' tool set. Our designs offer extensive flexibility which include primary voltage distribution panelboards or single main breakers and single or dual secondary distribution panelboards.